Apple iPad has successfully entered into e-book market besides being used as a general tablet PC companion. In order to stay competitively in this market space, Barnes & Noble has introduced an entry level e-reader targeted for those users who are tight of budget. 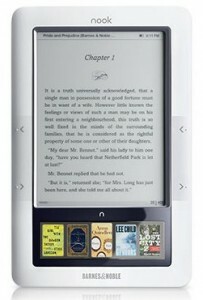 Named as Nook Wi-Fi, it has the 3G module stripped off, leaving only Wi-Fi capability which can be used to access any hotspot areas for seamless connectivity and e-book downloads. Physically, it doesn’t vary too much from its original 3G-version Nook except the 3G function. While still featuring with 3.5-inch color touch screen control panel with 6-inch of e-paper display with all the e-book lending and necessary software for easy access to its rich e-books and magazines database, the most important selling point here is the affordability with suggested retail price of merely $149, which is quite a substantial saving of $100 as compared to its original 3G version. In conjunction with the release, the famous online store has also revised Nook 3G model to $199 (from original $249) so that it can be more affordable to all especially those that prefer to surf under 3G cellular network instead of limited Wi-Fi access points. As an extra bonus, both current and new Nook e-reader devices will be supported with version 1.4 Android based software that enables access capability to AT&T Wi-Fi hotspots, besides larger fonts, ‘Go To Page’ features and many more. No doubt, this is a great move so that the price point of e-book can be adjusted to lower level, promoting electronics reading materials with wide eco-partners support. More importantly, Barnes and Nobles will able to position itself better even with stiff competition from Amazon Kindle and Apple iPad.